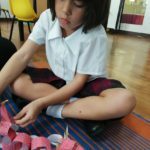 Recently the children celebrated Chinese New Year. 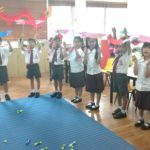 We were treated to a fantastic Chinese New Year assembly on Monday the 4th of February which the children really enjoyed. 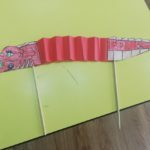 Our topic this half term is ‘Dragons’, and we looked at Chinese dragons and how we could make them in different ways. 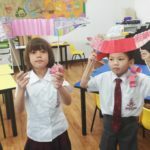 First we made some dragons using coloured paper and chopsticks. 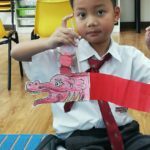 We folded the paper so that the dragon looked like it was moving, when we moved it around the room. 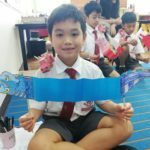 Next we looked at the art of paper folding. 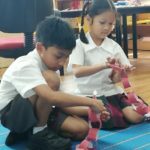 The children worked so carefully to make sure the folds were all in the correct place, then we made a dragon body out of a paper chain before putting the tail onto it. 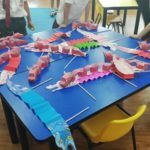 The children enjoyed posing with their paper dragons at the end of the week and we are looking forward to making a beautiful, colourful display now that they are finished!